Declining public spending on infrastructure over the last 20 years has made the specter of living in a world of splintering bridges, crumbling buildings, and leaking dams a very real possibility for millions of Americans. Yet, even if the estimated $3.6 trillion required to bring our infrastructure up-to-date were provided tomorrow, we still wouldn’t have enough welders to get the job done. Currently, a vast number of welders do not possess the skills and qualifications required by an increasingly high-tech industry. As a result, many companies are struggling to locate workers that can perform the necessary tasks. According to the United States Bureau of Labor Statistics (USBLS), over half-a-million manufacturing jobs in the U.S. will go unfilled in 2015, despite the industry’s rapidly growing need. The scarcity has resulted in a workforce crisis that is slowly unraveling the very fabric of the welding industry. This grim projection spurred The American Welding Society’s 2014 President, Dean Wilson, to join the National Association of Manufacturers (NAM) in brainstorming solutions. 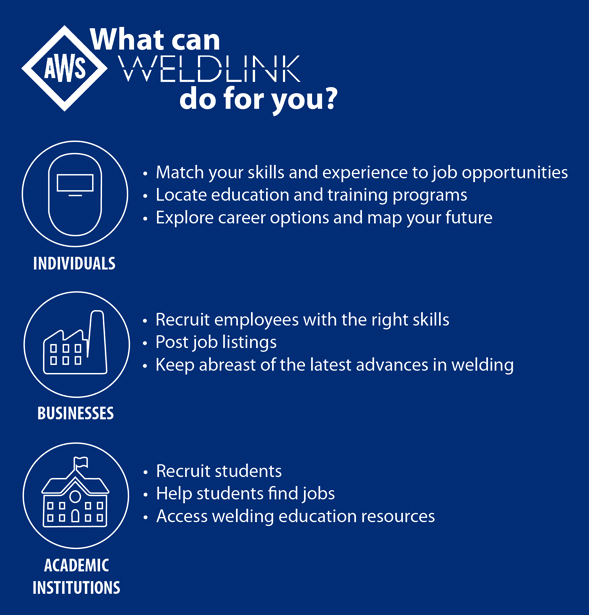 The result is WeldLink, a free, online career planning and management tool designed specifically for the needs of welders and welding professionals. It will help avert the looming crisis by spearheading a three-part mission: close the skills gap, connect people, and fill unoccupied jobs. WeldLink aims to close the skills gap by first facilitating the process of finding accurate information. Prior to WeldLink, gathering information on the different qualification processes involved numerous hours of sifting through websites. And not all of the material online is relevant, current, nor vetted. This can make becoming and remaining qualified a complicated and time-consuming endeavor. WeldLink overcomes this challenge by providing its users with all the information they need in one place, with just one click. 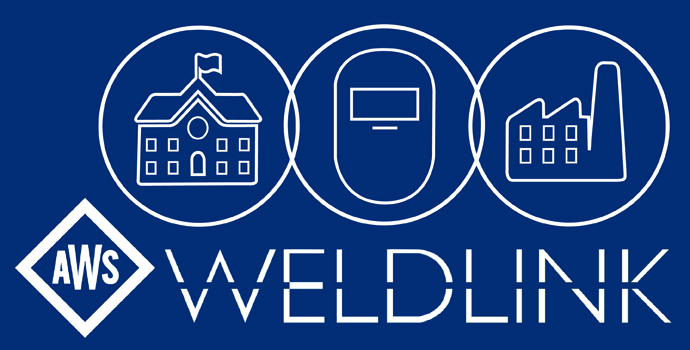 WeldLink also encourages continued education in order to meet the needs of the constantly-evolving welding industry. It customizes the experience by prompting users to create a profile that includes their current education, skills, and experience. WeldLink then matches users with exclusive resources and tools for staying up-to-date on the latest advancements in their unique fields. However, the ultimate goal of WeldLink is to urge users to “always think about the next step in their careers,” states David Hernandez, AWS’s WeldLink architect. Thus, WeldLink provides users with suggestions on additional career paths they can take based on their present qualifications. These recommendations come equipped with easy-to-follow, step-by-step directions for becoming qualified in that welding field or process. And if the user needs help preparing for exams, WeldLink has them covered with free study materials and practice tests. As users accomplish their goals, WeldLink will award them digital badges that represent knowledge, skills, certifications, careers, and education. These badges help users keep track of their qualifications and progress by mapping out their career path. WeldLink’s second major goal is to bridge the distance between individuals, businesses, and schools across the U.S. by bringing them together under one roof. According to Hernandez, WeldLink will function as the mecca for the entire welding industry, connecting thousands upon thousands of people! It is here where individuals will attain information about businesses and schools; where businesses will have access to quality workers; and where schools will be able to recruit students. This will facilitate the communication of expectations throughout the industry. Users also won’t have to wait by the grapevine to catch wind of any changes that impact their professional standing. With WeldLink, users can expect to hear firsthand about any changes in the industry. Weldlink’s algorithms sort through a multitude of industries, professions, and skill levels to bring job seekers and employers together. WeldLink Career Profiles match individuals to job opportunities that fit their qualifications. Businesses, in turn, can streamline their hiring process by honing in on only those candidates that meet the requirements of the available position. Last, but definitely not least, WeldLink aims to help fill the thousands of jobs that currently remain unoccupied by matching qualified job seekers with businesses in need. It works by allowing individuals to showcase their resumes while businesses post available jobs. However, unlike with other sites, WeldLink doesn’t force its users to navigate through a sea of job postings or applicants. Instead, WeldLink automatically matches individuals with businesses using the badge system. When there’s a match, both the individual and the business will be notified. This allows users to sit back and relax while WeldLink does all the work! With its multiple features, “WeldLink is a one-stop shop that will revolutionize the welding industry by helping welders, businesses, and schools all meet their diverse goals,” explains Hernandez. In the months to come, WeldLink will be changing the way people in the welding industry learn, interact, and do business.